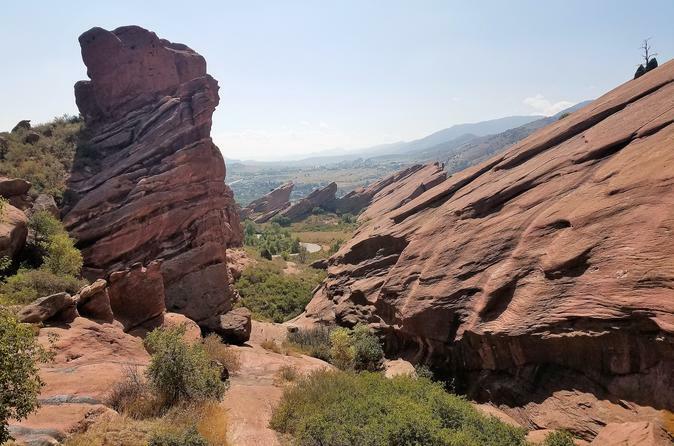 On this fantastic half day tour to the foothills outside of Denver, you will enjoy exploring the majesty of Red Rocks Park and Amphitheater and the geological wonders of the area. Enjoy sampling beer while touring the Coors Brewery or choose to stroll the historic streets and shops of Golden. Travel 2000 feet (610m) up the Lariat Trail Scenic and Historic Byway to the top of Lookout Mountain while viewing a breathtaking 200 mile (320km) panorama. Visit the Buffalo Bill Museum and Grave (admission included). Tour is limited to a maximum of 12 travelers. Your tour begins in front of historic Union Station in downtown Denver where your trained tour guide will pick you up in a clean and comfortable 12 passenger touring van. You will then travel up to the beautiful foothills of Colorado passing by Dinosaur Ridge and geological wonders on your way to Red Rocks Park and Amphitheater. Inside the park, you'll witness the majesty and beauty of the geological wonders that surround you. Then enjoy a walk into the only naturally acoustically perfect amphitheater in the world where many music legends have played at the Colorado Music Hall of Fame. Next, you will travel on the Historic Lariat Loop Scenic Byway to the historic town of Golden Colorado where you will tour the Coors Brewery. On the tour, learn about the beer making process and the colorful past of Adolph Coors and his family. You are welcome to enjoy samples of the different beer varieties that Coors brews in the tasting room. Your tour will continue on the Lariat Loop as you travel 2,000 feet (610m) up to the top of Lookout Mountain while viewing a breathtaking 200-mile view (320km) panorama. At the top, you may tour the Buffalo Bill Museum and grave. See memorabilia from his world-famous Wild West Show that included celebrities such as Annie Oakley and Sitting Bull. Pass by Genesee Mountain Park on your way back to Denver and see American Bison (buffalo) grazing on the hillsides. Your tour finishes back at Union Station where it began in Downtown Denver. Tour duration is approximately 4 1/2 hours. Admission to all attractions on the tour is included in the price along with water and snacks. Tour is limited to a maximum of 11 travelers.